It is no coincidence that READING LIPS opens with the main character asking Am I a gay man who happens to be deaf, or a deaf man who just happens to be gay? Because that is the same question that playwright Michael Conley faced several years ago when he began writing the play. Conleys hearing loss  30% in one ear, 40% in the other  is thought to be the side effect of a drug given when he was suffering from asthma as an infant. Unlike many children, however, the loss was diagnosed at the age of three, early for a time when many such disorders were not discovered until a child started school, or even later. As a result, he grew up with a lot of advantages that many other deaf children did not have: he was seen by ear doctors and started speech therapy lessons at an early age. He received his first hearing aid at the age of six. But the critical piece of information that doesnt come across is what audiologists refer to as sound discrimination. It is not unusual for a deaf person to be able to hear a voice and possibly even identify the speaker, but not to understand what the speaker is saying. Or not to be able to hear ordinary sounds that other people take for granted. That his hearing loss became apparent at an early age is especially noteworthy because he grew up in a small town of about 8,000 people. Junction City, Kansas, was not noted for ear doctors  or even hearing aid dealers. In fact, my hearing loss was discovered during a visit to relatives in Chicago and I got my first hearing aid there when I was six. After leaving Kansas at the age of ten and living briefly in Chicago, he finished high school in Wilmington, Delaware, and graduated from the University of Delaware. After graduating from college, Conley moved to New York to study film at Columbia University. I had always been interested in movies and felt fully prepared to take my place as the next David Lean. But a funny thing happened on the way to the Oscars: I took playwriting courses and realized I liked theater a lot more than film. Conley finished his coursework at Columbia and received his Masters degree in screenwriting. His thesis was an original screenplay about a gay man and a straight woman. the whole gamut. But for me, it was complicated by my hearing. 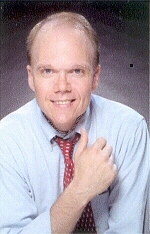 One of the reasons I loved living in New York is that its a great place to come out  to deal with being gay. During his 12 years there, Conley worked on a broad range of fronts, including counseling newly diagnosed people with AIDS at the Gay Mens Health Crisis, serving on public relations committees for several organizations, and working with Dignity, the national organization of lesbian and gay Catholics. He wrote the first full-page advertisement ever placed by a gay organization in a national publication (Newsweek, in 1987). For five years, he was Assistant Director for Development and Education at Lambda Legal Defense, a public interest law firm that defends the civil rights of gay people and people with AIDS. After moving to San Diego, Conley became involved with Scripteasers, a local playwrights development group. Since 1993, five of his plays have been given their first public readings by the group and three (including READING LIPS) have been staged. But it was the plays about gay people that audiences  gay and straight  still continued to respond to most. After writing a series of short plays about gay men, he began to consider that perhaps he wasnt writing gay plays as much as he was writing plays about people who happened to be gay. It always amazes me that black playwrights who write about the people they know best  themselves  are asked whether theyre limiting themselves by writing only for black audiences. Thats the same box lesbian and gay playwrights can be forced into. But the truth is that no writer sets out to limit his audience  we all want as many people as possible to come and see our work. Ultimately, it just made more sense for me to write about gay people because they are the people I know best and theirs are the issues I care about most. The fact that those were also the plays that audiences seem to enjoy most was a happy coincidence. That realization turned out to be a major turning point. In fact, READING LIPS began as part of that series. But after working on it for a few weeks, Conley decided to expand it into a one-act play on its own, and after several more weeks, into a full-length, his first. Ive seen too many plays that worked as short pieces, but which had been expanded to two hours simply so the author could call his work full-length. That kind of expansion usually cant be sustained. I was determined that I wouldnt write a full-length until I had something to say. Meanwhile, hes also been building MEN ABOUT TOWN. Three sections have already been staged in San Diego: FRANK TALK, EPIDEMIC EPISODES and FIVE ENDINGS (which was also staged in New York). Two more are nearly complete: FIRST DATE and POST MORTEM, both of which continue the two-character motif. In the summer of 1995, Conley read Jeb and Dash: A Diary of Gay Life, by Ina Russell. Jeb and Dash are pseudonyms for Ms. Russells uncle and his best friend, two gay men who lived in Washington, D.C., during the 1920s and 30s. The book is based on the diaries of her uncle. For a number of personal reasons, Jeb and Dash stayed with me. Not only is it the story of a writer, but it also reclaims a part of history  that of gay people within mainstream society. It was a book I could not get out of my mind. In May, 1999, Conley signed a contract to turn Jeb and Dash into a full-length play.